Avocado on toast is becoming one of the most talked about foods due to its filling and nutritious nature. 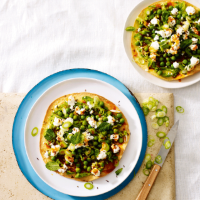 This recipe uses a lighter tortilla base and adds depth of flavour with harissa paste. 1. Preheat the oven to 200ºC, gas mark 6. Spray the tortillas with the oil and bake for 5-8 minutes until crisp and golden. 2. Meanwhile, cook the peas in boiling water for 2-3 minutes then drain and cool. 3. To make the dressing, stir together the harissa paste, olive oil and lemon juice. 4 Skin the avocado, cut in half and remove the stone. Mash each half roughly with a fork and spread onto each tortilla. Scatter over the peas, cheese, salad onions and cumin seeds. Drizzle over the dressing, scatter with mint leaves and serve.